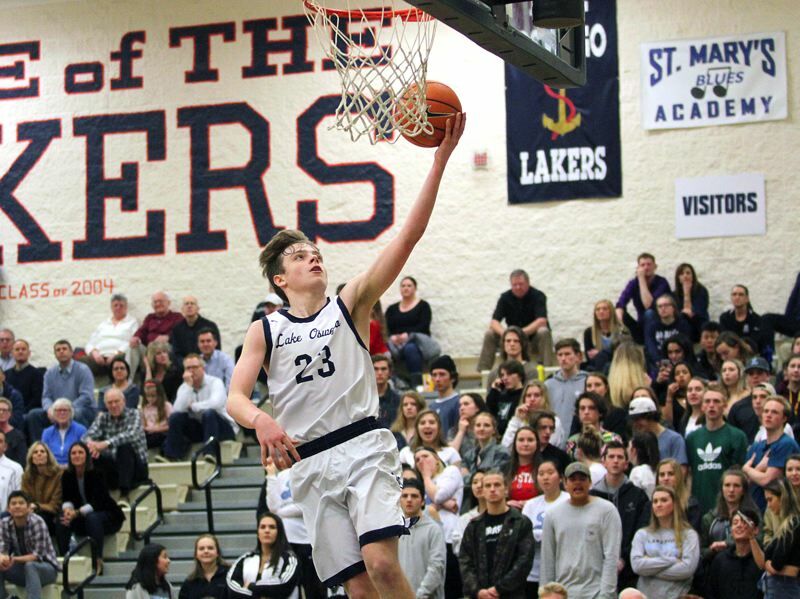 The Lake Oswego boys basketball team accomplished a lot of its goals during the 2017-18 season. The Lakers held their own in the Les Schwab Invitational, went 13-1 to dislodge West Linn and win the Three Rivers League for the first time since 2013, then rolled into the Class 6A state playoffs as Oregon's sixth-seeded team. But Lake Oswego fell short in its second-round playoff game, falling to Lincoln in double-overtime and missing out on a berth to the state tournament. While the Lakers would clearly like to remedy that shortcoming in 2018-19, coach Marshall Cho chose instead to focus on one simple goal. "We are looking forward to defending our league title," he said. The Lakers appear well-heeled to do just that thanks to the return of four all-leaguers, that group led by 6-foot-3 senior guard Josh Angle (a first-team all-TRL pick a year ago), 6-2 junior guard Sam Abere (the TRL's Defensive Player of the Year in 2017-18), 5-11 sophomore guard Wayne McKinney III (a second-team pick in '18) and 6-1 senior guard/wing Brandon Roberts (an honorable mention pick who just finished his senior football season on Saturday). "Josh Angle has been a leader in the program from day one. He will be counted on significantly," Cho said, adding that "Wayne McKinney is taking on the (point guard) role and being asked to lead more." In addition to Angle and McKinney, Abere and 6-4 junior guard Casey Graver have already been proving themselves anew. "Two of the most consistent leaders, on and off the court, since end of last season have been … Sam Abere and Casey Graver," Cho said. Joining that quintet in the regular playing rotation will be 6-7 senior Fred Harding, 6-6 sophomore post Trace Salton (he's out with an ankle injury until January), 6-3 sophomore guard/forward Jack Woolf, 6-5 junior forward Grant Brauner and 6-2 senior forward Dylan Senf. Also ready to challenge for varsity playing time are 6-5 senior post Grant Fuson, 6-0 senior guard Amir Fenderski, junior Cody Carlson and junior Noah Kniss. The Lakers may also benefit from the addition of senior guard Matt Armsby, a Lakeridge transfer who has been limited thus far due to an ankle injury. Another varsity player from a year ago, junior guard Ben Jeffers, transferred to Lincoln. As to the coming 2018-19 Three Rivers League race, Cho expects his Lakers to battle West Linn, Tigard and Tualatin for the league crown. "West Linn has plenty of talent to go around to challenge for title," he said. "Tigard will have two exceptional players in (Stevie) Schlabach and (Drew) Carter. And I expect Tualatin to surprise people. They have some impressive guards and wings." • To read the West Linn boys team preview, click here. • To read the Lakeridge boys team preview, click here.